The 16th century Jehay Castle is particularly original, with a checkerboard facade of brown and light grey stones. The seigneury of Jehay was first mentioned in written documents in 1130. The domain passed to several families and in 1492 becomes the property of Arnould of Mérode who marries the heiress Joan of Sart. The Mérode family built the present castle in 1550. In 1680, Ferdinand-Maximilian of Mérode sells Jehay to Francis of Gand-Vilain van den Steen, baron of Saive et grand mayor of Liège. 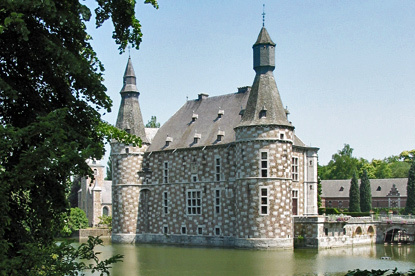 The Count Guy van den Steen, descendant of Francis, still occupied the castle until his death in 1999. Since then the castle has belonged to the Province of Liège. 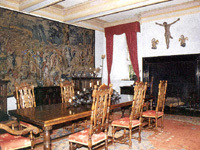 The castle served as a home for the Belgian Railway worker's children during WWII and it was left in a pitiful condition. 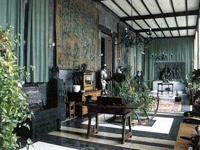 Count Guy van den Steen and his wife, the Marquise of Ormonde, undertook to restore the interior castle completely with furniture of the same period as the originals. 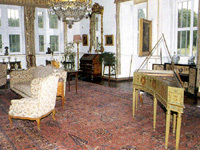 Of principal interests are the great dining room, which blends Gothic and Renaissance styles, the 18th century small dining room, the sumptuous 17th to 19th century library, the 17th-18th century smoking room, the well-lit grand hall, the 17th and 18th century living room, as well as the small hall. Jehay Castle is open from June to September on weekends from 11 am to 6 pm. It is also open on Wednesdays from 2 to 5pm in June, Tuesday to Friday from 2 to 6pm in July and August, and Tuesdays and Wednesdays from 2 to 5pm in September. Admission is 5 € for adults, 2.5 € for children and students under 18 and is free for children under 6. Jehay is between Huy (8km) and Liege (about 15km). By car, take the exit 5 or 6 on the E42 (Mons-Namur-Liege) and follow the indications for Jehay (towards Amay). If you don't have a car, take a train to Amay from Liege (23min), Namur (47min) or Huy (6min). Jehay is only 2km from Amay. You can catch bus No 46 to Jemeppe or a taxi from Amay station.